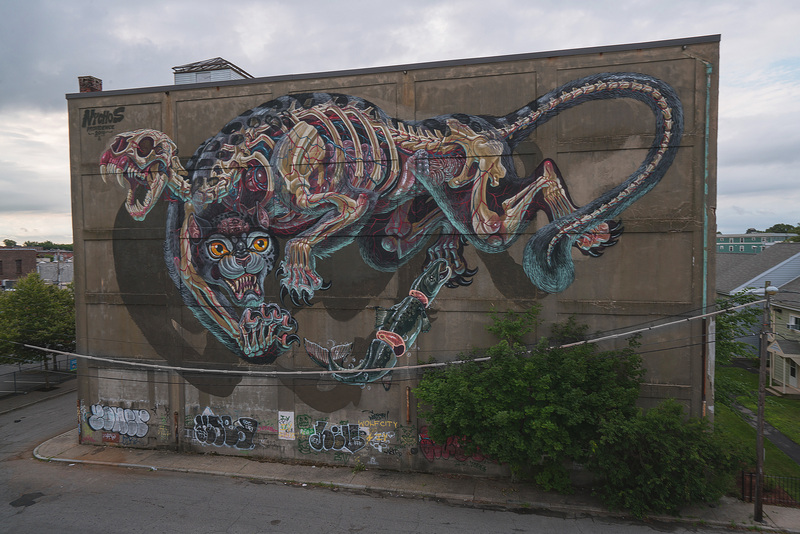 This Summer, Lolo YS and Nychos made a trip out to Providence, Rhode Island to paint for a project entitled “Influx”. Curated by Inoperable Gallery and sponsored by the Avenue Concept. Providence, Rhode Island is a city whose contemporary public art scene is surprisingly new, given that it is home to the prestigious Rhode Island School of Design. 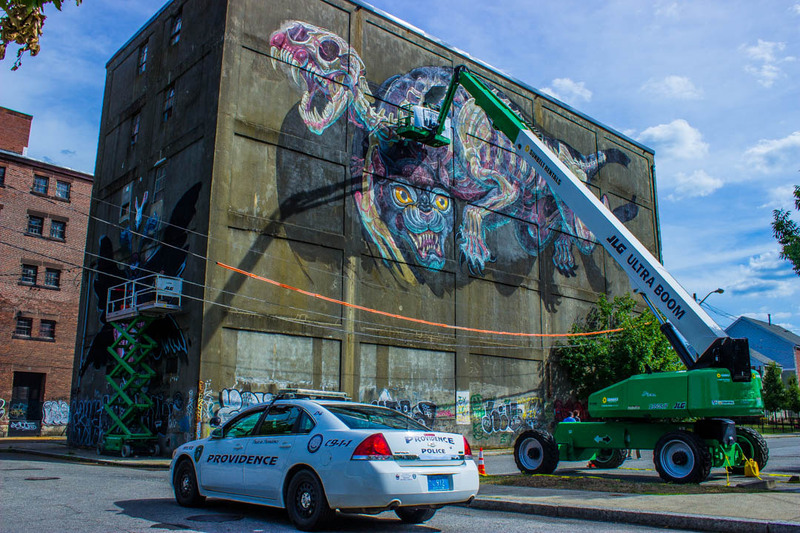 In a city where street art giants like Shepard Fairey first studied and painted in the streets decades ago, it is only in the past three years that large-scale murals have found their way into the Providence landscape. Nychos – known for his massive eviscerated creatures – painted a translucent snow leopard reaching for a salmon. The piece is representative of his latest technical, conceptual work which involves using his spray technique to render translucencies over the animal anatomies. 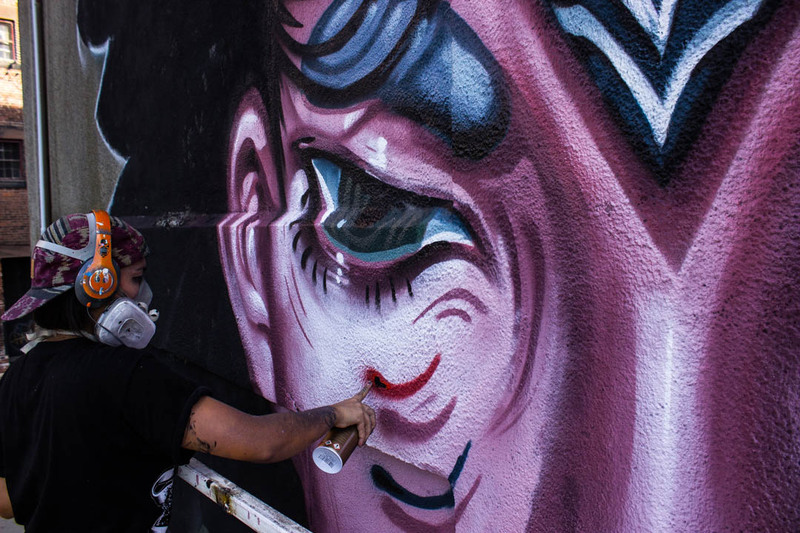 He has perfected this technique over decades of painting hard in the streets. This staggering mural entitled “Battlecat” overlooks the low-income housing project and has been welcomed warmly by the community. Until just recently, it was Nychos’ largest piece to date. Lolo YS, an artist from Denver, Colorado painted a female face whose hair unfurls out to create the wings of a moth. Entitled “Night Flight” Lolo’s piece is symbolic of the transportive power of creativity. She studied Providence as a student, so she wanted to paint something to remind the students, who pass by it, how their work can carry them places. The piece is also inspired by the nomadic lifestyle of a mural painter – as well as the many gypsy moths that have coincidentally made Providence their home this summer. The Avenue Concept is the powerhouse behind bringing these gorgeous works of art into Providence. 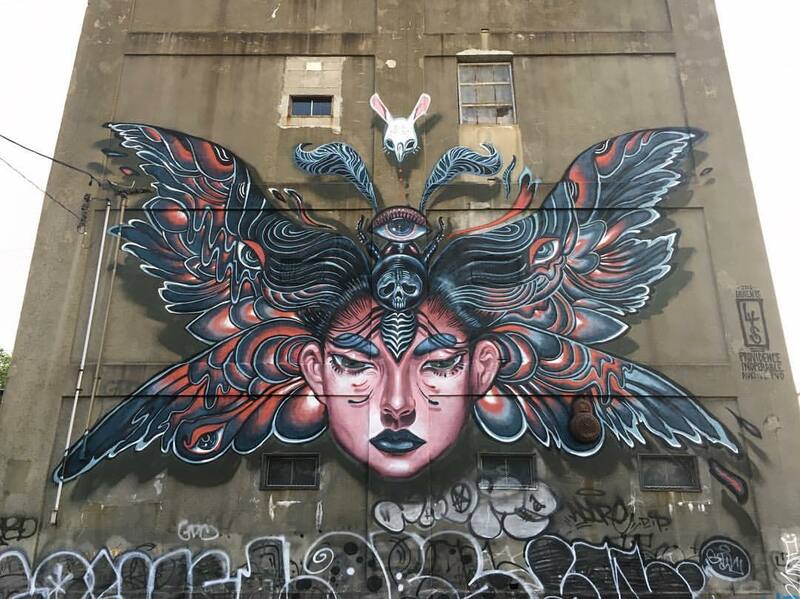 Created by some of the the biggest mural artists painting today: Bezt (Etam Cru), Natalia Rak, Mik Shida, Evoca1 and now Nychos and Lolo YS. A non-profit dedicated to funding arts projects and rewriting the cities policy on public arts, the Avenue Concept has been making some big waves in Rhode Island. 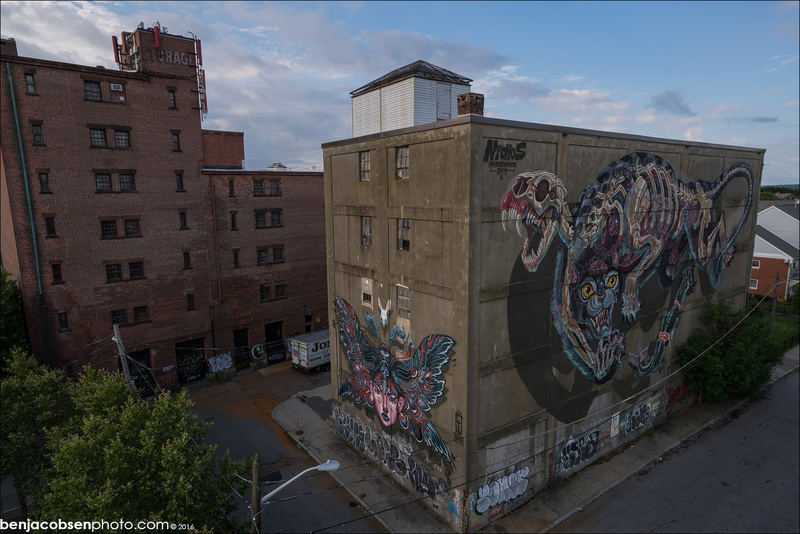 Not to mention, Providence is now home to the biggest murals by BEZT and NYCHOS! Not bad for the smallest state in America.